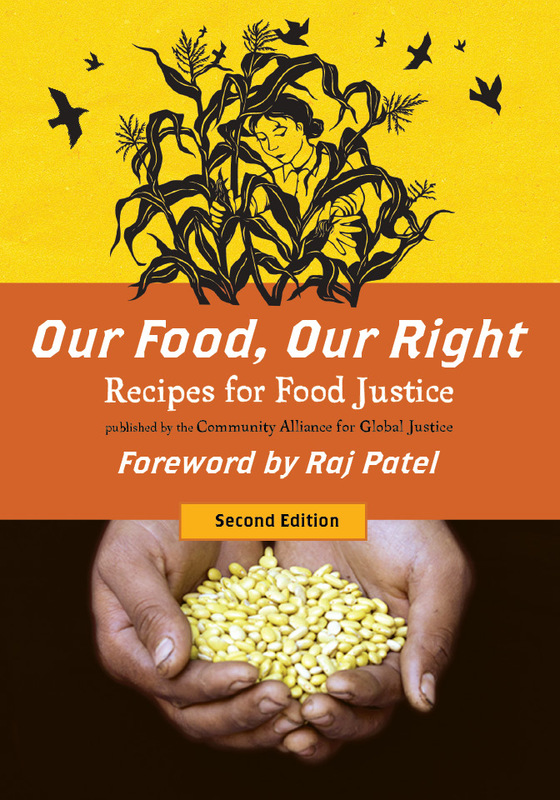 Have you read the amazing reviews from authors and activists Eric Holt-Gimenez, Mark Winne, Brian Tokar, and community college culinary school chef Gregg Shiosaki about “Our Food, Our Right: Recipes for Food Justice”? Check them out below! If you haven’t gotten your copy, order it online today. Save the date for some upcoming readings with Our Food, Our Right contributors in Olympia on February 27. “Local food is all the rage these days, and rightfully so. People across the US are increasingly frustrated by the chemical-laden, processed calories that pass for food in most major supermarkets and are increasingly looking to alternative sources, from farmers markets and farm share programs to co-ops and natural food stores. But with food prices rising everywhere, healthy food is in danger of becoming even more of an elite niche market, accessible only to those with surplus income to spend. While some of us will pay more for food that is local, organic and fair-trade, many of our neighbors are often limited by shrinking household budgets to food that is nutrient-deficient, genetically engineered, and potentially hazardous to health. 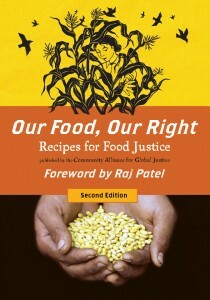 Fortunately, new movements committed to food justice and food sovereignty are challenging this paradigm, and a new book, Our Food, Our Right, by the Seattle-based Community Alliance for Global Justice, offers a comprehensive, inviting, and highly accessible introduction to all the inspiring new efforts to democratize our food system and make good food accessible to all. Filled with stories from local efforts in the Seattle area and beyond, the book helps us see a much broader scope of challenges to agribusiness dominance and illuminates often-invisible efforts based in immigrant neighborhoods, innovative community garden projects, and on sustainable local farms, among others. We get a glimpse into Native American kitchens, new efforts to organize farmworkers, and the front lines of resistance to agribusiness control and GMOs from as far away as Brazil and Kenya. The book also features interviews with an impressive array of farmers, mainly youthful ones, whose farms are urban, subscription-based (CSA), biodynamic, or located on formerly vacant lots. The interviews offer an opportunity to understand each farm’s unique challenges, accomplishments, and how they benefit from community support. There are numerous photos and illustrations, and even a section of color photos. “I’ve selected Our Food, Our Right [OFOR] as the textbook for my Sustainable Food System Practices class at Seattle Culinary Academy. It starts by introducing the concept of Food Sovereignty, which is how I begin my class. It is full of examples of what people have accomplished to bring about positive changes in our struggling food system. The Farmer Profiles chapter is a reminder that farmers’ struggles and successes are interrelated to our communities. I feel that it is a great educational tool for aspiring culinary professionals who want to make food justice part of their work. Posted in News and tagged education, food justice, ofor.